“Raffles Hotel stands for all the fables of the exotic East”, as playwright Somerset Maughan described this majestic 130 year old colonial masterpiece. With its Art Deco style, antique finishes and rooms with cathedral sized proportions, you'll be transported back to the heydays of its 1920’s glamour. 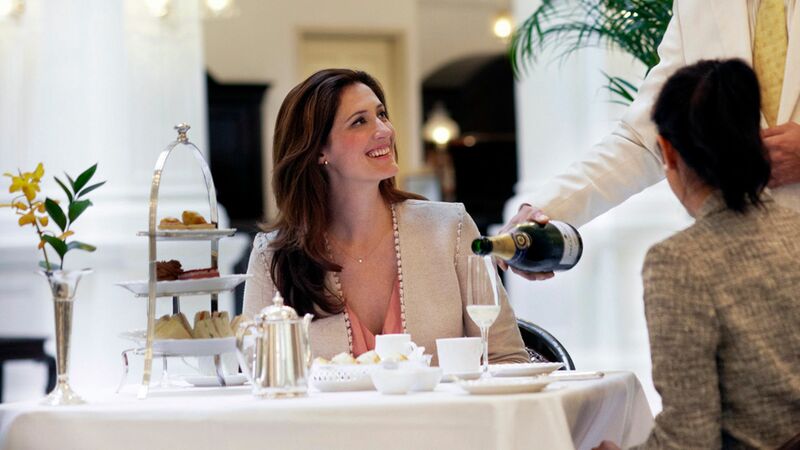 Immerse yourself in a world of luxury. Upon check in you'll be handed a ‘Singapore Sling’, the world famous gin cocktail which was first created in its Long Bar. Your every need will be catered for by a butler, including unpacking and packing. And you can enjoy exquisite food onsite, from morning till night, with several decedent restaurant options offering unique flavours from around the world. Hotel child prices apply to ages 6-11 years. Boasting a modern kitchen creating contemporary French cuisine sprinkled with Asian influences, Raffles Grill is guaranteed to pique and satisfy the taste buds of everyone who sits down for a meal here. The dress code is smart casual. No t-shirts, flip flops or trainers are permitted. 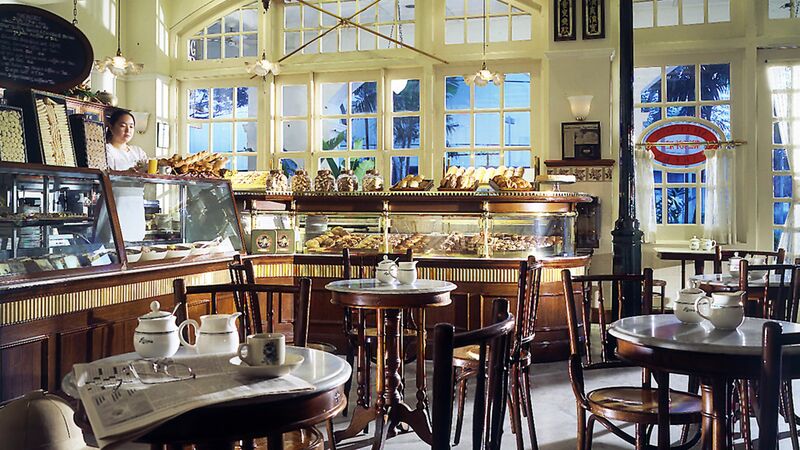 Indulge in a wide variety of freshly baked, oven warm pastries in this renowned bakery. Start your day with a flaky, all butter croissant and intense coffee before heading back for an English afternoon tea featuring creamy, lavish cakes. Experience the grandeur and historical colonial-era ambience of this time honoured drinking establishment, which has been serving its patrons since 1896. The extensive drinks menu offers over 400 whiskeys, as well as vibrant cocktails. Be sure to enjoy these elegant surroundings on Friday and Saturday as you listen to live Jazz music. Serving prime cuts of Australian beef cooked to perfection and fresh seafood delicately seasoned and beautifully served, this is the ideal place to indulge. The birthplace of the world famous Singapore Sling cocktail, no visit to the city would be complete without sampling this iconic gin, Cointreau and grenadine concoction. Asides from the renowned cocktail, a well stocked bar, satisfying bar snacks and the refined surroundings make this the perfect place to while away a few hours. This informal eatery serves up rustic Italian cuisine in a chic and casual al fresco setting that overlooks the entrance to the hotel. It's the perfect place to people watch over an authentic Italian pizza and an expertly crafted cocktail. 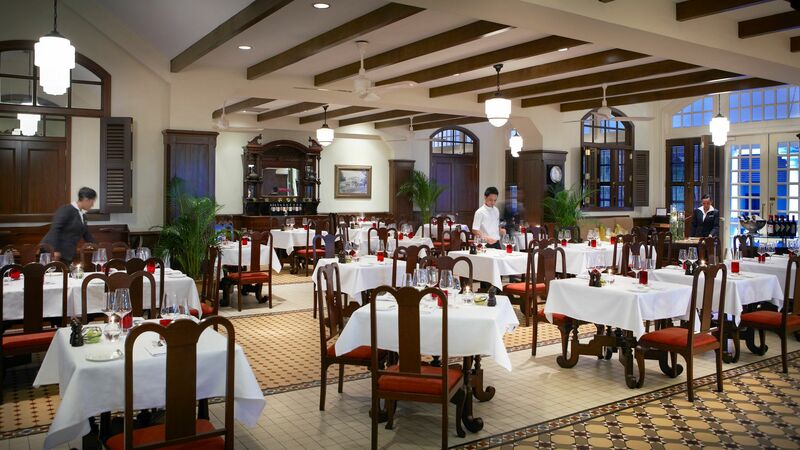 As the main dining room in the hotel, you can be assured that the elegant colonial-era glamour continues here. Featuring wooden ceiling fans, pristine white walls and a tranquil aura, this is the perfect place to indulge in a North Indian buffet. The food is as authentic in aroma and taste as anything in New Delhi or Jaipur. Soak up some more history in this elegant lobby based bar, which is dedicated to all the famous wordsmiths who have stayed as a guest or written about this iconic hotel. With names such as Joseph Conrad, Rudyard Kipling and W. Somerset Maugham associated with Raffles, the literary legacy is clear for all to see and a must stop for anyone looking for something unique. Unwind in the exclusive rooftop pool surrounded by the gleaming skyscrapers of Downtown Singapore. The solarium offers an array of loungers and a bar service, so you can lie in peace while the attendants bring you refreshments. 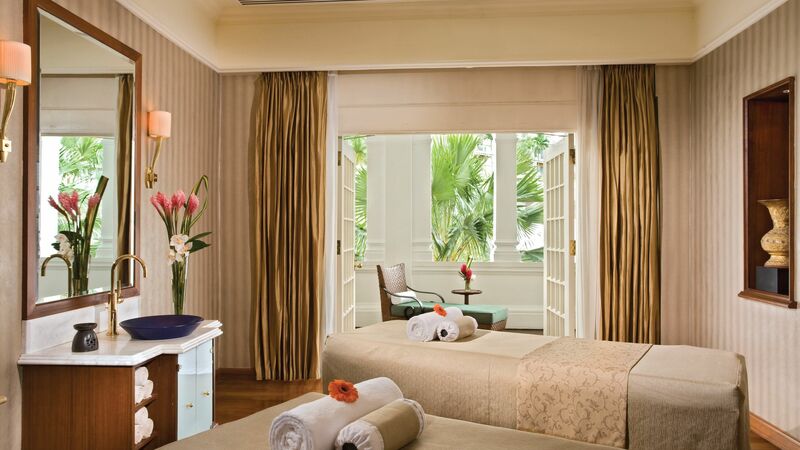 Take some time for yourself with a trip to the luxurious onsite spa. The team here are professionals, offering specialist treatments in aromatherapy, naturopathy and Ayurvedic medicine. The onsite, guests only gym boasts a range of state of the art technical equipment. From resistance machines, to cross trainers and exercise bikes, whatever your goal, you will find the facilities to achieve it here. For those in need of retail therapy, the Raffles Shopping Arcade has a wide range of bespoke tailors, boutique brands and up and coming luxury independent designers. The finely manicured hotel gardens are just as breath taking as the hotel building and well worth a wander around. Two minutes among the greenery and you'll easy see why this building is listed as a national monument. 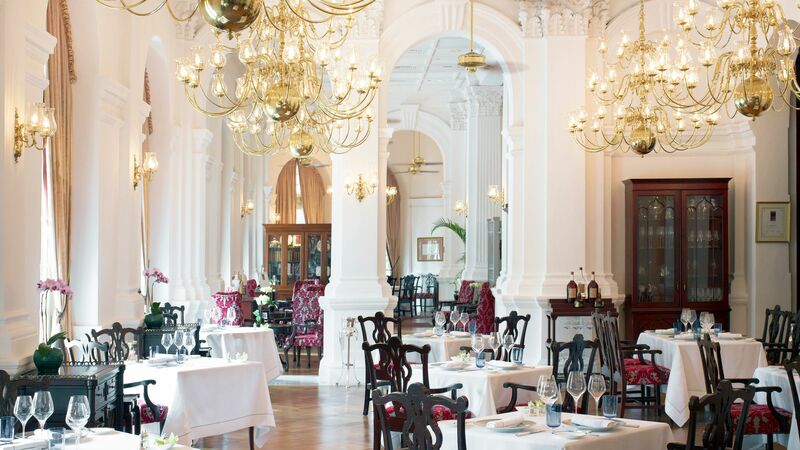 Raffles Hotel Singapore is located in the lively city centre, providing a distinct contrast to the skyscrapers which tower around it. It’s located close to the National Gallery, where you can view wonderful Asian artists’ work, as well as St Andrews Cathedral and the National Museum of Singapore. Just minutes away you’ll find the Gardens by the Bay, which features magnificent, futuristic towers housing beautiful botanic gardens, waterfalls and many species of flowers and plants. Spend your days in Singapore visiting the shopping malls and markets, where you can pick up trinkets and Asian souvenirs, as well as designer clothes. Afterwards, enjoy street food and delicious Michelin starred restaurants, serving food featuring Japanese, Chinese and Indian influences. 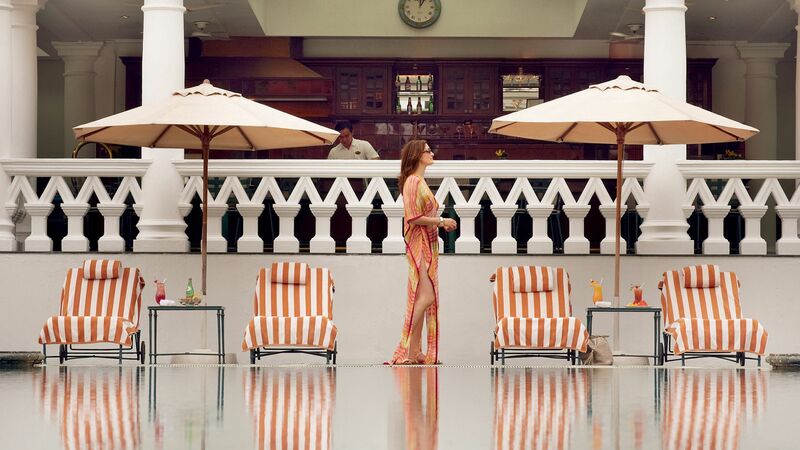 Raffles Hotel is a 20 minute drive from Singapore International Airport. Courtyard Suites measure approximately 58m² and feature a separate bedroom with one king or two twin beds, spacious lounge and study area, en-suite bathroom with separate walk-in shower and a bathtub and a shared veranda overlooking the courtyard, also offering complimentary WiFi and a DVD player. Palm Court Suites measure approximately 60 - 79m² and feature a separate bedroom with one king or two twin beds, spacious lounge and study area, en-suite bathroom with separate walk-in shower and a bathtub and a shared veranda overlooking the lush gardens, also offering complimentary WiFi and a DVD player. Personality Suites measure approximately 55 - 58m² and feature a separate bedroom with one king or two twin beds, spacious lounge and study area, en-suite bathroom with separate walk-in shower and a bathtub and a shared veranda. “ You can?? ?t not go to Raffles ! Obviously everyone knows drinks are not going to be cheap , but how can you not go to Raffles if it?? ?s your first trip to Singapore. Kids even entertained with the peanuts and shells all over the floor ! Great ambience! This building is the absolute mix of history and class in this part of Singapore. So many new hotels have come up but Raffles has a delightful service culture, efficiency and they took care of me with authentic care. We were pampered, great concierge, bar and breakfast. 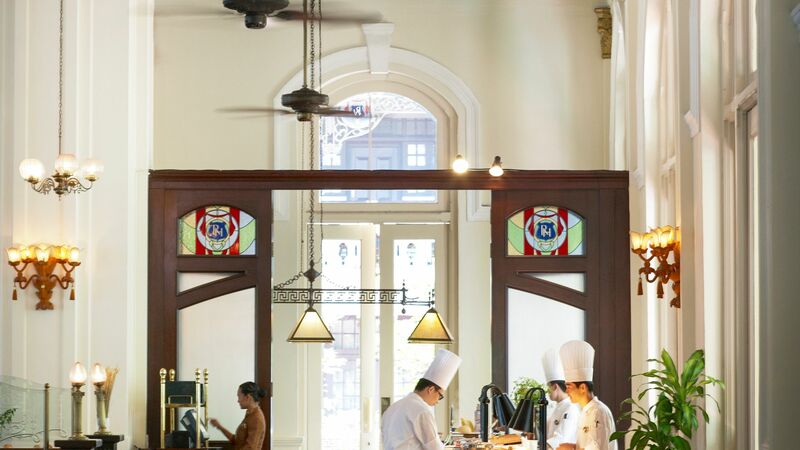 The Raffles Hotel is currently being refurbished but some of the colonial splendour of this Singapore landmark can still be found in the Long Bar. You queue to enter, which means that the bar itself is kept uncrowded. The Singapore Sling is an expensive gin-based cocktail but you?? ?ve got to do it. Each table features a large bag of free peanuts. The tradition is to brush your empty shells onto the floor, making this the only place in Singapore where littering is encouraged. People have been doing this for 100 years and sitting here, you feel a strange connection with them. Highly recommended.